Eeek. I can’t believe I’m already done with more than half of my third year of medical school. Seriously! When patients ask me how much time I have left, I have started saying, “About a year” because it just seems easier than saying 16 months. 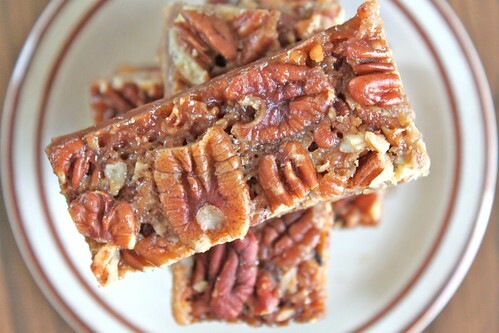 To mark the end of my internal medicine rotation, and the end of a very good 3 weeks working in Lima, I decided to make these pecan bars to bring into the office. I have to admit that when I started this rotation, I was a little bummed about having to leave our brand new puppy for 3 weeks, but it has really worked out for the best. I’ve gotten to come home quite a bit, the gym in Lima is really nice, and being somewhere unfamiliar with no real television has a way of making you get a lot done. Plus, the doctor I’m working with is a great teacher, and now I can actually read an EKG confidently! He has also reminded me that being stressed out at your job is really your choice- it doesn’t get the job done any better, or faster, and it makes me feel like crap. 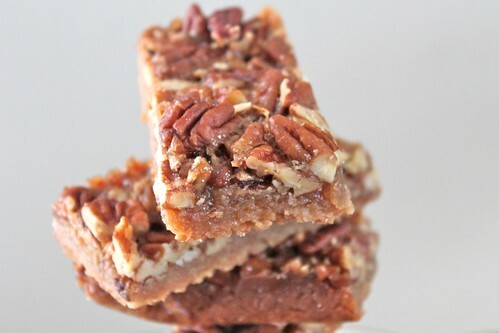 So about these pecan bars. Everyone at the office (including myself), loved these, and a few people even asked me for the recipe. (Of course, I was immediately excited to be able give them the “Spice is Nice” business cards I got for Christmas… it’s the little things.) I was between this recipe and one from Barefoot Contessa. I went with one because the Ina version called for over a pound of butter (granted it made a larger pan…but still!) I’m certainly glad I did because there is really nothing I would change about this recipe. I accidentally forgot to drizzle chocolate over the top, but in retrospect I’m kind of glad I left it off. These were plenty rich on their own, but if you are a true chocolate lover, feel free to make this into a chocolate and pecan dessert. For the crust: Preheat oven to 350º. To prepare the pan, spray a 9-inch square baking pan with nonstick cooking spray. Fold two 16-inch pieces of foil or parchment paper perpendicular to one another in the baking pan so that there is overhang around all the edges. Overlap is important to ensure filling doesn’t leak below one layer. Spray the sheets with nonstick cooking spray. Place the flour, baking powder, salt, brown sugar, and 1/4 cup pecans in a food processor. Process the mixture until it resembles coarse cornmeal, about 5 one-second pulses. Add the butter and pulse until the mixture resembles sand, about 10 one-second pulses. Pat the mixture evenly into the prepared pan and bake until the crust is light brown, about 20 minutes. For the filling: While the crust is in the oven, whisk together the melted butter, brown sugar, corn syrup, vanilla, bourbon, and salt and egg, in a medium bowl until just combined. Pour the filling on top of the hot crust and sprinkle the 1 & 3/4 cups pecans evenly over the top. Bake until the top is brown and cracks start to form across the surface, 22 to 25 minutes. Cool on a wire rack for about 1 hour. For the drizzle: Melt the bittersweet chocolate, if using, in the microwave for about 30 seconds, stirring frequently. Drizzle the chocolate evenly over the cooled bars.Let sit until room temperature, about 1 hour. Remove the bars from the pan using the foil or parchment paper “handles” and transfer to a cutting board; cut into desired sizes. This entry was posted on February 2, 2012 by Spice Is Nice. It was filed under Bar Cookies, Dessert and was tagged with Bar Cookie, chocolate drizzle, pecan bars, pecan pie. Nom nom nom….these look delicious! You should probably give me a few of those business cards…I tell so many people about your awesome blog!